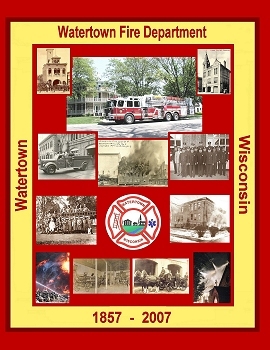 The 150 year history of the Watertown Fire Department is now available. This comprehensive reference book is filled with images and details on the history of the department, fully indexed and also documents the major fires that have occurred in the city. 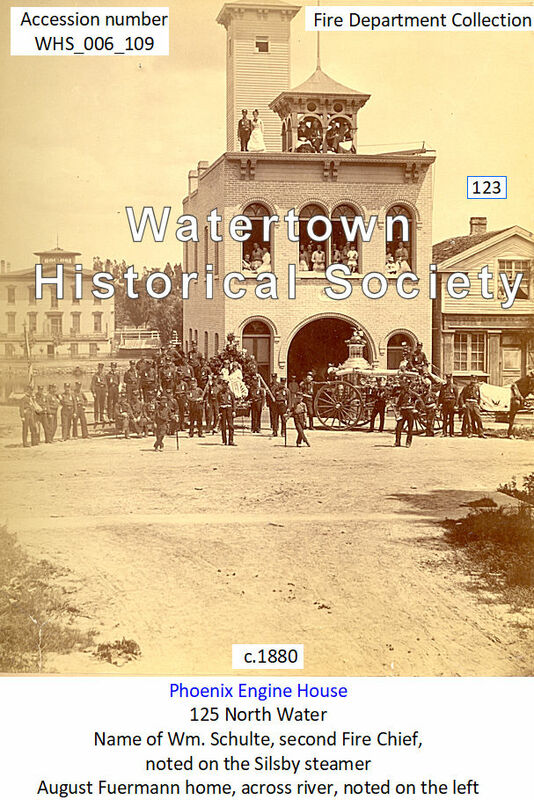 All proceeds derived from the sale of this book go to benefit the Watertown Historical Society. 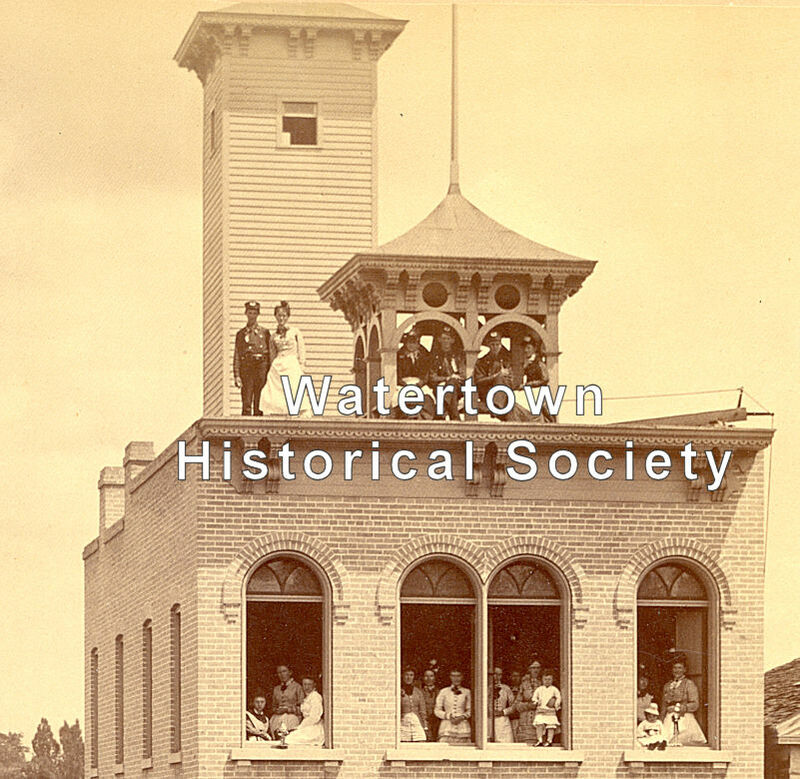 Those wishing to order copies, which make fine gifts, may do so by sending their check of this amount to the Watertown Historical Society, 919 Charles St., Watertown, WI 53094. A new brewery of Mr. Jacob Hoeffner took fire early on Saturday evening last. Upon the alarm being given, there was a very prompt and general turn-out on the part of our citizens; but before they had time to reach the spot, the flames were subdued without any serious injury having been sustained. If the cry of "Fire!" is justly startling to a community having a large and well-disciplined fire department, what should it be to one whose only means of defense against the devouring elements consists in a few hooks and ladders and a mere handful of rickety pails, without a regular organization for the use of either? We must acknowledge that we have the worst of fears for the safety of our village. As a general thing, our buildings are not only of the most combustible materials, but probably nine-tenths of them have no other stove chimneys, many of which are pierced in the garret by three or four different pipes. The ventilated condition of most of these garrets would admit of a spark being soon fanned into a flame; and a flame once kindled, how could it be conquered, so long as it found material upon which to riot, with no engine and no concerted effort to battle it? We would call the attention of our citizens to this subject. Common Council Proceedings: The Clerk read a communication of E. Johnson by which he delivers over to the Council the fire engine, as one of the members of the old Company. By Ald. Fischer, petition of C. Meyer and 51 other inhabitants of this city to be formed into a Fire Company and to be entrusted with the City Engine, which was, on motion of Ald. Prentiss, referred to a special Committee of three, with instructions to report at the next meeting. The Mayor appointed as such Committee Ald. Beckman, Dennis and Fischer. Ald. Beckmann of the special committee appointed to confer with the petitioners for a new fire company made a report by resolution, which was amended by Ald. Prentiss and adopted. Resolved, That the Petitioners and others joining them, as soon as they shall have organized themselves into a company, [and] selected their officers, shall constitute and be known as Fire Company No. 1, and take in charge and into their custody the fire engine of this city and be responsible for its management and safe keeping. Resolved, That an Engine House be built according to the plans and specifications of C. M. Ducasse, and that the Clerk shall advertise for sealed proposals for building the same. Resolved, That the plans of L. Charbeneau for an Engine House be adopted and that the Clerk is hereby directed to advertise that he will receive sealed proposals for building said Engine House according to the plans and specifications of said L. Charbeneau. Ald. Pfundheller called for the reading of the resolutions introduced by him at the last meeting in regard to building an Engine House, which were read by the clerk. Ald. Rogan introduced an agreement of Messrs. Huger and Rusch to deed to the city thirty feet in the center of O’Connell Street in the Fourth ward if the city vacates said street for the purpose of building an Engine House thereon; also the written opinion of D. Hall, Esq., to the effect that if the city vacates the street, the adjoining lot owners can give a good title for that part of the street and accompanied by the following resolution which he offered as a substitute. Resolved, That the proposition of Messrs. Huger & Rusch donating a part of O’Connell Street for the purpose of an Engine House be accepted and that the Mayor be and he is hereby authorized to procure a title deed to the land named in said proposition. Resolved, That so much of O’Connell Street as lays between Water Street and Rock River be and the same is hereby vacated. The motion to substitute the foregoing resolutions was lost . . . . On motion the resolutions introduced by Ald. Pfundheller were taken up separately. The plans and specifications of the new Engine House, in the First Ward, have been prepared by Louis Charbeneau and the work, we understand, will soon be commenced. The building is to be of brick, twenty-six feet eight inches front by forty-two feet deep and two stories high, with a basement. The basement is to be eight feet between joists and the first story thirteen feet and the second story twelve feet high in front and nine feet in the rear. This will give a structure of fair dimensions, with ample room for all the purposes for which it is intended. Its location will be central and convenient. 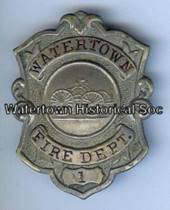 Sunday night, the 15th of January, at about midnight, a fire broke out in the wooden building, known as the Pioneer Store, on the southwest corner of Main and Second streets. The structure was totally destroyed by the winter blaze. The loss was total as there was no insurance on either building or contents. At the time of the fire the building was owned by Mrs. Cordelia Gilman and had been occupied by Henry Vaudel as a saloon. The adjoining building [115 E Main], owned and occupied by Frederick & Henry Meyer as a shoe store, was considerably damaged and would have been also lost if it were not for the strenuous efforts of citizens. Jesse Moulton and M. Welsh [Welch] both removed the contents from their grocery stores in the two buildings to the west [113 and 111 E Main? ], as they were also threatened at the time. As is too often the case, the Water Witch proved to be of little value. After it had been pulled to the scene it once again was found to be out of order. And once again Brewmaster Joseph Bursinger’s force pump was hurriedly conveyed to the scene of the fire and performed well in arresting the flames. In fact, had it not been for Bursinger’s pump, the loss of business property and inventory on Main Street would have been much more serious and extensive. On display, Pioneer Engine No. 1 is splendid, but when real service is required, for some reason or other, it is never ready when most wanted and generally proves to be a nuisance when around. It is high time this city had an efficient and reliable Fire Department. Some hour this city may pay dearly for the continued neglect of so necessary a precaution against the desolation and ruin of the devouring flames. It is far better to be wise, active and fully prepared in season. Common Council: Resolved that all resolutions heretofore passed at this Council, with reference to the purchase by the city of certain property on Main Street owned by William Chapman, be and the same are hereby rescinded. Resolved that a committee of three members of this Council be appointed by his Honor, the Mayor, for the purpose of receiving proposals for an Engine House and doing the work thereon; the Engine House aforesaid, to be erected upon the lot purchased by the city of Mayor Lindon and as near as practicable, in accordance with the plan furnished by L. Charbeneau, provided that the expense of said building complete, exclusive of the lot, shall not exceed $2,500. Adopted. 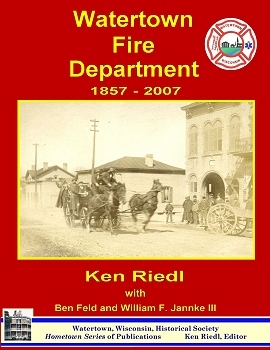 On the evening of February 19th fire was discovered in a large two-story wooden building standing on the southwest corner of Main and First streets. The fire originated on the second story room occupied by J. D. Kellogg as a Photograph Gallery. The flames increased rapidly and in a short time the upper portion of the building was in ablaze. All of the photographer’s property and stock was lost. The first floor level of the structure was occupied by a Mrs. Stallman as a millinery store. Most of her stock was removed during the course of the fire. Along First Street, adjoining the corner building, stood another wooden building, belonging to Henry Graves, and occupied by F. Meyer as a grocery store, which was badly damaged and rendered nearly worthless. The next building along the Main Street side was owned and occupied by E. Sweeney as a grocery store, which escaped damage, as did the next owned by John Luber. The next building is a brick block, owned and operated by Joseph Salick, as a jewelry store. As a matter of prudence his stock was packed up and removed from the premises. The upper story of this block was occupied by Mr. B. Wortkotter as a dwelling and all of his belongings were removed. [same date] The most urgent and necessary want of this city is a well-organized Fire Department. The reasons which make this important must be apparent to all. Here is a populous city, liable at any moment to be desolated by fire, with a single [volunteer] fire company to arrest the progress of the flames, and no means of protection except the neglected engine, with nobody to work or take care of it. We are destitute of all other implements, such as hooks, ladders, ropes, axes, to help in pulling down or removing burning and exposed buildings. Such a state of things ought not to be permitted to exist one hour longer than it is absolutely necessary to furnish these facilities. A single fire, which may break out at any moment in the day or night, may inflict a greater loss than the whole expense of procuring all the implements needed to save our stores and houses from certain destruction. We have been fortunate so far in subduing the few fires that have recently taken place, but we cannot always be sure that the weather will be favorable, the winds calm, and common efforts successful. The best is to be fully prepared for the worst dangers that may threaten us. We trust our city authorities will act in this matter without delay. Though heavily burdened with taxes of all kinds, we believe our citizens are ready and willing to incur any reasonable outlay to remedy this evil and place themselves in a condition of tolerable security. One good Engine Company and one good Hook and Ladder Company are the least force that should constitute our Fire Department at the present time. Now we have neither of these agencies to defend us from conflagrations. The Common Council ought to give its attention to this subject immediately. We can only talk. They can act to the purpose and do what ought to be done. [same date] Common Council Proceedings: The Clerk read the report of the Marshal in which he states that he took possession of the following articles belonging to the Fire Department: 2 oil cans, 2 lamps, 2 speaking trumpets, 5 wrenches, 1 water pail and 1 stove. [same date] It shall not be lawful for any person or persons, company, association or corporation to build, erect, construct, or cause to be built, erected or constructed, upon any of the lots, pieces or parcels of ground named in the first section of this ordinance, any building or buildings of any kind whatever which shall not be made of stone, brick or other materials which are deemed and considered proof against fire. As the old wooden buildings one after another disappear from Main Street, either from decay or fire, they ought not to be replaced by structures of the same inflammable material. To prevent this, and as far as possible obviate the present liability to a constant succession of fires, the Common Council ought to pass an ordinance making [marking] out certain limits within which no wooden building shall in the future be erected. This is usually done in all cities after they have reached a certain state of growth, and the time has come when this step should be taken by us, as a protection against disastrous calamities from fire. If this course is adopted, Main Street in a few years will have a much better appearance than it now has. As the old and dilapidated buildings, which did very well ten or fifteen years ago, are gradually removed, they will be replaced by elegant brick blocks, and we shall have as fine a looking business street as can be seen in any other interior city of the state. If we are going ahead at all, let us do the right way. Sheds not exceeding twelve feet in height at the peak or highest part, and privies not exceeding ten square feet and ten feet in height at the peak, may be constructed of wood . . . All depositories of ashes within and without the fire limits shall be built of brick or other fire proof material, without wood in any part thereof. Common Council Proceedings: Against General Fund, M. Cummings $9 for work at Engine House, P. C. Quentmeyer $465.46 for brick for Engine House. Petition of F. O’Rourke and others for artesian wells. Referred to Committee on Fire Department. Foreman — T. Racek, Jr.
1st Asst. — G. Henze. 2d Asst. — C. Ceck. Secretary — W. H. Rohr. Hose Capt. — A. Benkerdorf. Asst. Capt. — L. Kehr. The above names give us the assurance that we have at last one good reliable fire company established, and now would it not be a good move for some other portion of our citizens to organize another company. There is nothing like emulation among fire companies for the advancement of a thorough fire department. Organized on April 17, 1869. First officers: Foreman, John Reichardt; First Assistant, Nic Bruegger; Second Assistant, Fred Stylow; Secretary, Gustav Barthmann; Treasurer, Carl Goeldner. The H&L Company vehicle occupied a portion of the South First Street engine house, alongside the pumper. 10 26 GAS SUPPLIED TO ENGINE HOUSE and Lockup on S. First St.
One of the most serious calamities that ever befell our city occurred on the night of 28th of Dec. 1870, by the total destruction by fire of the Empire Flouring Mills, on the west side of the river, together with its contents, including a large amount of flour and wheat. Immediately on the north side, and within 40 feet of the mill is situated the Woolen Factory, owned by Mr. Daniel Jones, and containing valuable machinery and stock, and adjoining this building is the Sash and Door Manufactory of Mr. G. B. Lewis. As a precautionary measure against fire, Mr. Smith had surrounded his mill, which was a frame building, with brick walls, and the saving of the Woolen Factory is mainly due to this fore thought on the part of Mr. Smith for all endeavors to save this building would have been unavailing had not the north wall of the mill stood as a barricade between the intense heat and angry flames and the Woolen Factory. The Peshtigo Fire was a forest fire that took place on October 8, 1871 in and around Peshtigo, Wisconsin. It was a firestorm that caused the most deaths by fire in United States history, with estimated deaths of around 1,500 people, possibly as many as 2,500. Occurred on the same day as the more famous Great Chicago Fire. An Eyewitness Account. The Great Fires of 1871. Wikipedia article. 10 25 DANGER YET--Notwithstanding the recent rains everything is as parched and dry as tinder again, and great danger of fires still exists. Many persons appear to be wholly indifferent as to the dry condition of things around them, and by their extreme carelessness are placing property in great danger. We see that some parties are burning rubbish, which at a time like this is extremely dangerous and should be strictly prohibited. The use of firearms should be dispensed with, for the time being, as in the present combustible condition of things hunters are apt to start fires in the woods and on marshes, from shooting. The hum of machinery in a country mill gave off soft music in the small hours of the night, bringing assurance to the timid that men were awake and about their business. Its low pitched whistle was the FIRST TO SOUND THE ALARM OF FIRE, summoning the volunteers to their duties. It stood sentinel over the sleeping town. "The Globe Milling Company, Watertown, Wisconsin, 1845-1945." On motion by Com. Solliday the Committee on Public Buildings was instructed to enter into a contract with the lowest responsible bidder, for building said stable as soon as that part of O'Connell Street be vacated for that purpose. 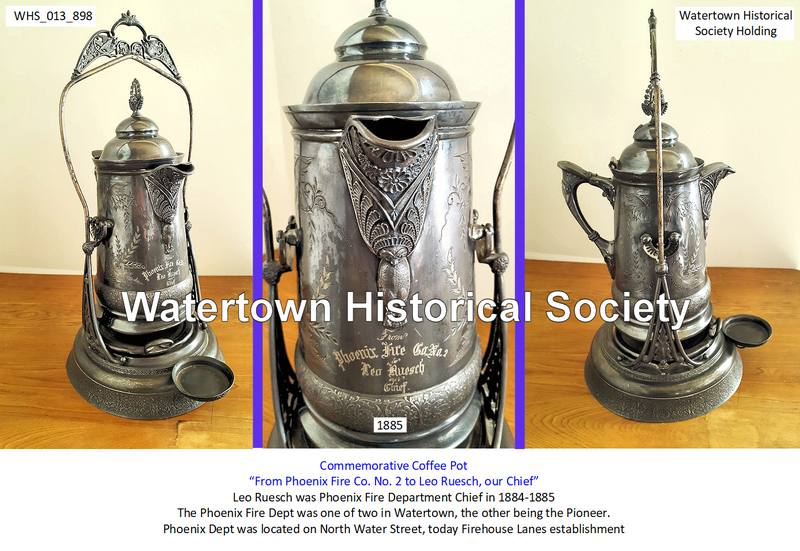 The Republican reported in April the new sprinkling cart manned and equipped by the Phoenix Fire Company boys made its appearance on the streets for the first time. The Company owned its own team, which, “when not in use on the Silsby is made to turn an honest penny in keeping down the dust on the streets. The sprinkler had a large number of patrons, and promises to do very satisfactory work.” The sprinkler was built after the style of carts used for street sprinkling in Chicago, and sprinkles one-half of a street at each drive through it. The cart was ornamented with the advertising of several local merchants. 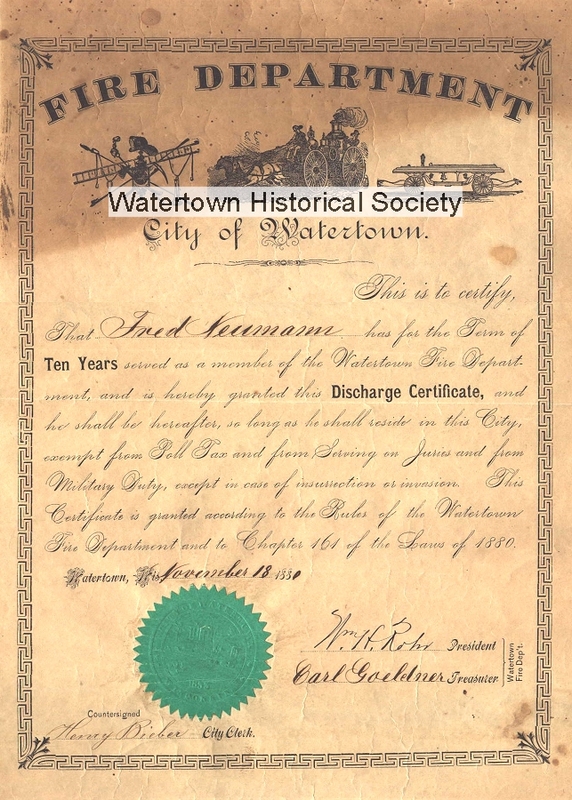 Sim Robinson handled the ribbons on the cart, and “takes particular pains to see that none of the ladies get their shoes or dresses wet who chance to be near a crossing as he passes by.” Watertown Republican, 04 20 1887 and Watertown Gazette, 04 22 1887. 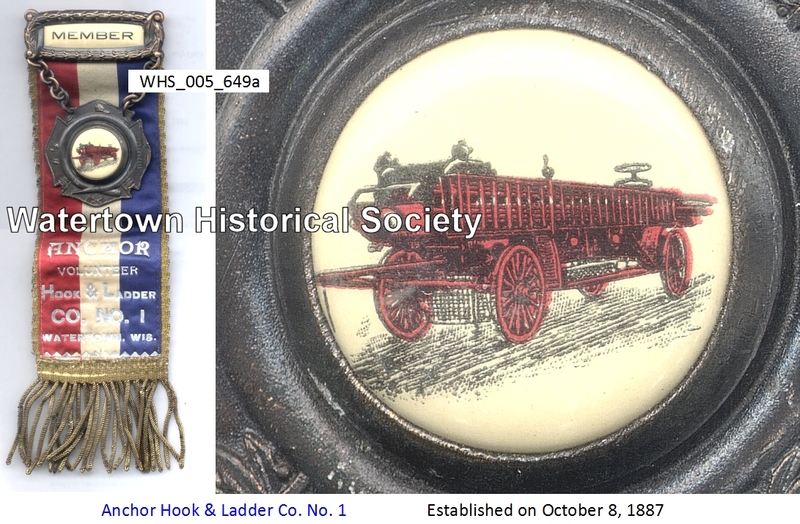 Anchor Hook & Ladder Co. No. 1 ribbon, "Pat. Oct. 18? ?, Mar. 7, '98"
Charles Hoeffner funeral; the Phoenix Fire Co turned out in uniform. The Old Lindon House Barn with all its contents totally consumed; James Casey’s Warehouse burned to the ground; Conley’s Saloon slightly damaged and several other places badly scorched. 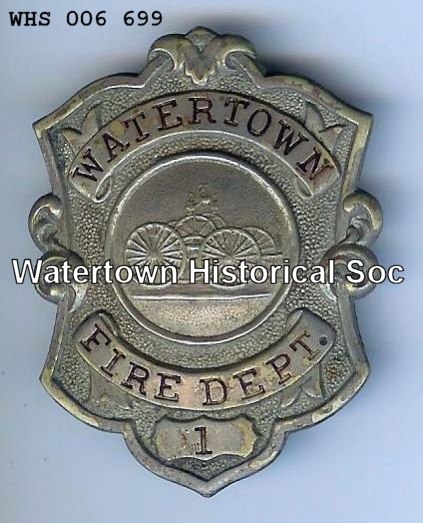 Last Sunday morning at about 2 o’clock one of the most disastrous fires that has ever occurred In Watertown broke out in the old Lindon House barn on the West Side, and before the firemen could get the fire under control some $15,000 worth of property was consumed. The old barn fired up like a powder mill and in a few minutes after the blaze was first discovered over half a dozen places took fire therefrom. James D. Casey’s warehouse and contents were totally consumed; Tremont House badly damaged; Conley's Saloon slightly burned, and all the sheds in that vicinity were reduced to ashes. At one time it looked as though the whole business portion of the west side might succumb to the flames, but by the heroic and excellent work of the firemen the flames were confined to the immediate vicinity where they were first kindled. The firemen in all the companies did good work, especially when it is taken into consideration that two blocks of frontage had to be protected by them. It was with difficulty that the American House and barns were saved, also Casey's blacksmith shop, Conley's saloon and Seager’s barbershop. All the firemen injured lately by the turning over onto them of the hook and ladder truck are able to be out again, except Nic. Simon, who is still in a very serious condition. The proposal of the health officer to occupy the old engine house on First Street as an emergency hospital, provided the privilege is granted by the council, meets with some opposition, especially from those living and doing business in the vicinity. [same date] Shortly before midnight Saturday night the fire bells rang, the alarm being caused by a fire breaking out in the barn building of J. P. Herzog, Second ward. The fire department at once responded to the call and the streams applied smothered the blaze before much harm was done the building. A lot of chickens in the barn quietly roosted away all through the commotion and flew around as lively as ever next morning. Edward Weigel, aged 11 years, whose home is on North First Street, was taken before Justice Halliger, October 21, under a criminal complaint for having stolen a watch, the property of G. Boehn, and the youthful culprit was committed to the Reform school at Waukesha. Other offenses came out against him in the examination, such as stealing dinner pails from the children of St. Henri's school, from which is was evident that he required to be taken care of. Sometime before the boy had been charged with tempting to set fire at St. Henri's church, having sprinkled oil, obtained in the church, on the floor and then scattered matches over the surface so that a person walking might ignite the matches and set the blaze going. But Justice Halliger, from his proofs, decided that there was no cause of action and discharged him. And now come the startling denouement. When Deputy Sheriff Graewe was leaving the Reform school to return home, young Weigel confessed to him and the keeper to having set fire to Paul Herzog's barn and since then the astounding intelligence is received that in addition to this burning he admits that he set fire to the factory of G. B. Lewis & Co. and Geo. W. Evans' livery stable, involving a destruction of some $25,000 worth of property. In our issue of last week we referred briefly to the arrest of John Schlueter charged with setting fire to G. B. Lewis & Co.’s bee hive factory in February. As stated, Mr. Parks, the junior member of the company, visited the reform school at Waukesha for the purpose of getting a confession out of Eddy Weigel, a boy 11 years of age sent from here to that institution last October, with the suspicion hanging over him that he knew all about the various fires that were kindled here the present year, involving the loss of over $25,000 worth of property in the destruction of the G. B. Lewis Co.’s bee hive factory, the Watertown woolen mill, Geo. W. Evans’ livery barn and the Herzog and Lange barns. When Mr. Parks first began interviewing young Weigel, he was reluctant to telling all he knew about these fires, but he finally made a clean breast of it. He stated that he fired Evans’ and Lange’s barns merely for the sake of seeing a fire, and Herzog's barn because some of the Herzog family were mad at his folks, and called him names because they did not buy beer at Herzog's saloon, and he fired the barn to get even with them. With regard to the Lewis fire, he stated that he and Schlueter planned this fire because they had applied for work at the Lewis factory and were refused. Early in the evening they passed some time in a barn back of the William Pell house in the 5th ward, and then strolled down towards Weber’s lumber yard, thence down to the river bank, and waited around the mills and factory until the electric lights went out. 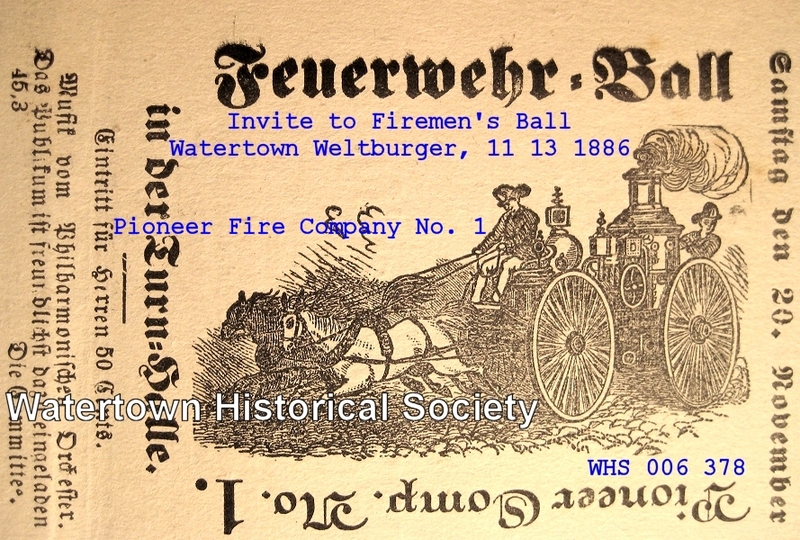 Weigel gave a minute description of the interior of the factory at the place therein where they started the fire on the night in question, so that there can be no doubt of his story being correct. As soon as the electric lights were turned off, both entered the basement door on the south of the factory leading from the alley way between there and the woolen mill, Schlueter applied the match whilst Weigel stood guard outside watching so that they could not be surprised in their nefarious work. When everything was ready, Weigel went outside to watch, but returned again to inform Schlueter that a man was passing by and they had better wait awhile longer. They did so, and both returned to their respective posts. Schlueter applied the match to a pile of shavings in the fore part of the basement and then skipped outside, calling to his partner to run. Both started on the run, got separated in Weber's lumber yard, but came together again near Jesse Stone's residence, and then proceeded to Hughes' barn nearby, where they passed the night. On arriving home from Waukesha, Mr. Parks had Schlueter arrested. He was closely questioned as to his connection with the Lewis fire, and told substantially the same story as above. . . .
. . . . It is a relief to know that older persons were not engaged in this work. Both boys will probably spend the best years of their lives in the reform school, if not in the state prison, and it is hoped that with this as an example before them, other boys here may be prevented from ever engaging in such despicable work. The Main Building of the University Group Struck by Lightning. Shortly after 10 o clock Monday night, during the storm which had set in just previously, the terrific electric bolt which was so generally noticed for its severity struck the flag-staff on the belfry of the main building of the Northwestern University, and in hardly less time than it takes to tell it the belfry and the entire roof were completely enveloped in a sheet of flames. 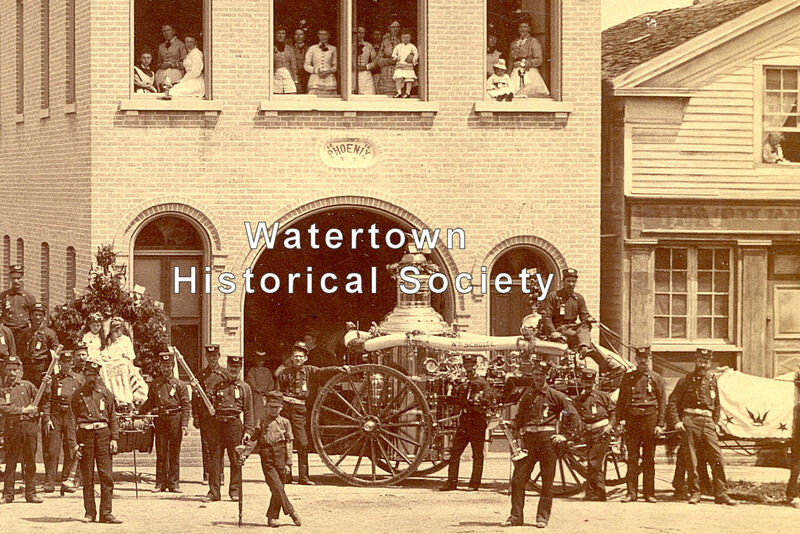 The fire department bustled to the scene of action as soon as possible, but was unable to render effective assistance in subduing the flames until an hour later, owing to the distance of the steamers from the burning building which was fully a half mile, at the cistern on the corner of Main Street and College Avenue. This made it difficult for the engines to force water through the hose with sufficient strength to be of any aid. Finally a good stream was secured by placing one of the streamers half way between the cistern and the building and forcing the water from that point when it was received from the other engine. The firemen worked all night and until noon yesterday over the ruins. After the fire had gained a good foot hold on the roof it spread rapidly to the inside of the building and completely gutted it. Nothing but the massive brick walls are left, and these may possibly have to be torn down for safety. The rainfall in progress at the time no doubt prevented the fire from touching the adjoining buildings and making it even more destructive than it was. Some good work was done in saving the contents of the building. A portion of the furniture and a considerable part of the valuable library were removed by willing hands. Some insurance was carried, but how much cannot be exactly ascertained as yet. The board of trustees had charge of this and it was carried in Milwaukee agencies. It is thought it does not amount to over $5,000 or $8,000, which is very small in comparison to the whole loss. This is conservatively estimated to be at least $25,000 above the insurance. Nothing can be said at this writing of the plans of the board of trustees, of which Rev. Mr. Bading, of Milwaukee, is president, as to replacing the building. A fire was discovered at noon yesterday in the Empire Mill of the Globe Milling company, and for a time it was feared the company would suffer a loss like that sustained last August in the destruction of the Globe mill. But the alarm was hastily given and the firemen were at work without delay, subduing the flames before any headway had been gained. Several streams of water were at work, both on the outside and inside of the mill, and the chances were altogether against the fire spreading. The flames were located in the bran room, connected with which is a conveyor from the elevator. One of the buckets of this conveyor had in some manner got out of running order, thereby stopping the movement of the belting, and the continued revolving of the drive pulley – which was directly at the head of the conveyor, where the grain was discharged to the bran room produced a friction on the belting which in time burned the latter. The communication of the flames to the bran followed, the fact being discovered by William Wurtzler and others of the mill hands just as they were about to leave for dinner. The property owned by William Jaedecke, surrounding the southwest corner of Main and Seventh streets, was visited by the fire fiend at an early hour Sunday morning and considerable damage was done. The fire extended to the lumber yard of Brittingham & Hixon, adjoining on the west, but aside from the burning of a few piles of lumber and cedar posts, no great damage was done in that quarter . . . There is perhaps no more dangerous locality in the city for a fire than this block, and with the high eastern wind prevailing at the time it is a marvel that more property was not destroyed. Excellent work, however, was performed by the fire department, under the supervision of Chief McLaughlin, and this, coupled with the lucky rainfall, prevented the flames from spreading. The firemen are entitled to much praise for their heroic and tireless effort in the face of many obstacles, the principal of which was the lack of water. The origin of the fire is unknown, although many circumstances point to incendiarism. It is said that there was a strong smell of kerosene during the fire's progress. On West Main Street; one doubts that it was of incendiary origin. 11 13 The location of street hydrants of the water system was definitely arranged at the council meeting Saturday evening. There are to be 149 of them, which will pretty thoroughly cover the city. Section 1. The duties of the engineer of the fire department shall be to keep the fire engine No. 2 in good repair and ready for use and properly care for the same, and to run it at all fires when it shall be called out by the chief of the fire department; To keep clean and well-oiled and wiped engine No. 1, so that the same will not rust; to attend as a fireman all fires, going with the hose wagon; but if the fire engine shall be called out, he shall return and run it; to be janitor of the Phoenix engine house and keep the same clean and in good order, and to sleep there; to wash the hose after fires or when used, and to change them in the hose-wagon as often as necessary, so that they will not crack; to run the steam roller when requested so to do by the city engineer, and to keep the same clean and properly wiped and oiled when not in use. A small blaze in the rear of the residence of Wm. Buchheit called out the fire department Friday evening, a section of the fence having taken fire from burning refuse. The fire was easily extinguished, and no damage of any account resulted. A fire run by the local department was on the program, and it proved a most agreeable surprise. Eight pieces of apparatus, including the wagon carrying the chief and assistant chief, were used and the run was a most exciting and thrilling feature. It was cleverly conceived and carried out without a hitch. . . . As the float of the William Hartig Brewing company, one of the last in the parade, neared Main Street bridge, it caught fire from the burning of red light and had to be taken out of the line of march. The fire alarm was sounded and the department promptly extinguished the blaze. This was the only accident that occurred to mar any of the three days’ proceedings.